Dress up, bring a baked item, donate small toys (baseball size or smaller) Friday morning for prizes, bring an appetite for the Dad's BBQ booth, get ready to have a blast! 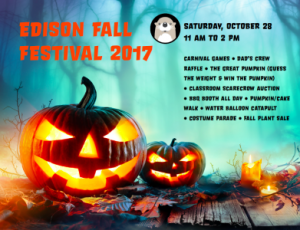 If you haven’t been to this Edison traditional event, this is a fun festival for the kids with lots of games, a donut eating contest, cake/pumpkin walks, a scarecrow auction, a water balloon shooter, art projects, food, and a costume parade for the kiddos. New this year -- a Plant Sale by the Garden Committee -- veggies, flowers, and succulents available. Go Green will also have a few exhibits with their Recycling Cart, Imperfect Produce, and Alameda Backyard Growers. Committee Chairs - The Dad’s Club welcomes any Committee exhibits or activities! Please contact the Dad's Club know if you will be participating.